Unfortunately little is known about the life of Berthold Geipel, especially about the earlier period of his life. Berthold Geipel was born to a rich family on the 11th of October 1888 in Fleiβen in Bohemia. Today this town is called Plesna and is situated in the Czech Republic. His father was a salesman. The town Plesná is located on the most western part of the Czech republic (former Czechoslovakia), in a county of Cheb (Eger in German language) and until the end of WWII was mostly populated by Germans. The whole county has been industrial area (mostly textile industry) in the period between the wars, in German usually referred as an Egerland, and formed part of the core of the so called Sudetenland - part of Czechoslovakia inhabited between the war mostly by German minority (or vast majority when speaking about the Sudetenland per se). In the town of Plesná one of major industrial enterpreises was also a leather processing factory of Johan Adam Geipel, which in days before WW I presented one of the most modern enterprises of its kind in the world. The Geipels were a rich family, their enterprise consisted also from a water mill (power plant) and a saw mill. In view of this information, I am not sure if Geipel was son of a salesman or if he is originated from the rich factory owner family. Anyway, he was from the same town and therefore it almost sure that at least he was from the broader family and this opened him a way to the education. At the age of 25 Geipel came to Erfurt. Possibly he had undergone a commercial education and obtained some experience in the (arms) industry in the South of Germany. During World War I, on the 3rd of March 1915, Geipel was forced to leave Erfurt because he was drafted for the war industry, probably fulfilling his duty at the Simson Arms factory in Heinrichs close to Suhl. It is important to mention that that the German war industry was managed by the military, so well trained engineers like Berthold Geipel could fulfill their military service for the war industry instead of being assigned to the army. During August and September of 1917 Geipel is back in Erfurt for a short period of 6 weeks where he married Klara Braband on the 18th of August 1917. He works and lives in Heinrichs till the 10th of May 1919. When he returns to Erfurt he starts working for the Deutschen Werke AG, Werk Erfurt. Geipel lived with his wife and parents-in-law until 1928. In 1922 their son, Rudolf Geipel, was born. As a result of the fierce Allied restrictions stipulated in the Versailles Treaty, all state factories of the “Reich”, which were engaged in war affiliated production, had to change their management from a military management to a business management and change their war production to “regular” production. In addition, state owned companies could be sold to a private entrepreneur. Deutsche Werke AG was written in the registry of the chamber of commerce on the 17th of June 1920. In this case the state took over the assets. In order to install a solid private management team, qualified men with a technical and business background were needed. Berthold Geipel was one of these men for the Deutschen Werke AG. Within 3 years after returning from Heinrichs, Geipel became the Director of the Erfurter part of the company. To give an idea of the size of this company; in June 1922 a total workforce of more than 40,000 people worked for this company of which almost 4000 were employed in Erfurt. During the early 1920’s, Deutsche Werke AG kept on producing hunting rifles and the famous “Ortgies” Pistol as well as tables, seats, beds, doors, typewriters and parts of trains. In the summer of 1923 an order to the management was made to stop all weapons production after an article was published in the “Daily Mail” that a big percentage of the production still was weapons production. Still the production of typewriters had a big future. In 1923, AEG became the major shareholder of more than 50% of stock. In 1924, Deutsche Werke AG, Werke Erfurt had completely changed over their production lines to manufacturing the “Europa” and later the well known “Olympia” typewriters. At that time, the production of small arms had no future anymore for Deutsche Werke. I believe that as a result of all these production changes, Geipels services were no longer needed or that he took a decision himself to continue his trade elsewhere in the arms industry. With a few specialists and specialized machinery which he obviously could arrange to purchase very cheaply, Geipels founded ERMA, Erfurter Maschinen- und Werkzeugfabrik GmbH in 1924. In this year also a 3th “prokurist” was added next to Keller and Beyer. Geipel remained Director. Geipel organized the workload between his two companies effectively. Business must have gone well since in 1928 Geipel bought himself and his family a villa which cost 27,000 RM in Hochheim, Erfurt. Erma continued with the development although this was forbidden by the Versailles treaty. Production of all 9mm and higher caliber weapons were forbidden. In order to get around this restriction, Erma started developing smaller calibers devices and (sub-caliber inserts) for larger caliber barrels. By 1932, more than 1000 people were working in their company. In 1934, Erma started to produce their first sub machine gun. This was known as the Erma EMP and later designated as the MP34. This was done after Erma signed a licensee contract with Heinrich Vollmer. Vollmer had developed the predeceasing VMP series with the financial funding of the “Inspektion für Waffen und Geräte”, which was the forerunner of the later “Heereswaffenamt der Wehrmacht”. However, after this organization stopped funding him he was forced to make a deal with a financially strong company, which turned out to be Erma. Geipel became nationally and internationally famous with the Erma EMP, which was sold to France, Spain, Bulgaria, Yugoslavia and some South American countries. The export versions were manufactured in various calibers: 7.63 Mauser, 7.65 Luger, 9mm Bergman, and of course 9mm. Apart from this success with the EMP, Erma also became famous with their small caliber pistols and their sub-caliber barrel inserts. As of 1935 Erma received a license from Mauser to produce the 98k rifle. The new Wehrmacht was growing at a very rapid pace and it needed an almost unlimited amount of weapons. During WWII, Erma produced more than 650.000 98k’s from 1936 to 1942. Which was 4.6% of the total 98k production. Erma identifying codes: S/27G in 1936, S/27 in 1937, 27 in 1938, and finally changed to AX in 1940 all with WaffenAmt inspector codes “280” (primary) “132” and “77” (secondary). Back to the sub machinegun development of Erma. The whole license agreement with Vollmer and the later successful marketing and production of the Erma EMP had gained the attention of the “Heereswaffenamt der Wehrmacht”. It is assumed that the relation between Geipel with the Heereswaffenamt must have grown closer because they financially helped out Geipel with his financial problems at the Erfurter Feinmechanische Werke J.Braband GmbH in 1935. After the financial injections the Erfurter Feinmechanische Werke J.Braband GmbH name was changed to the Feinmechanische Werke GmbH (in short FEIMA). At this time, National Socialistic Germany was preparing itself for war. The famous “Vierjahresplan” (Four Year Plan) which was proclaimed by Adolf Hitler in 1933 started in 1936. Part of this plan was to prepare the German industry for war production. At some point between 1934 and 1936 the “Heereswaffenamt der Wehrmacht” must have issued guidelines to Erma about the development of a radical new design with regard to the submachine gun. This would fit in the Blitzkrieg doctrine in which armored vehicles and tanks would play a big role. This “second generation” of the sub machinegun would be the new weapon of these armored forces. Based on the guidelines of the “Heereswaffenamt der Wehrmacht,” the Erma engineers initially developed the EMP36 and a small production run of about 15 weapons were made. The EMP36 must have been investigated thoroughly by the “Heereswaffenamt der Wehrmacht”. I think that under pressure of Hugo Schmeisser, who was “Wehrwirtschaftführer” (weapons economy leader) with regard to the sub machine gun production, the Heereswaffenamt was persuaded to use his patents with regard to the magazines and the whole magazine housing and bolt construction. So when in early 1938 the official order came to make a sub machine gun sample, Erma could quickly produced a proto type of the MP38. Although nothing is really known about the development progression from the Erma EMP to the MP40 with regard to the real inventor, I think the series of events that I just described leave no question about how things must have roughly gone. A lot of politics and cronyism was involved in the development of the MP series. I still believe that Hugo Schmeisser was the kind of “master of puppets” in the development, maybe not as early as 1934/35, but very soon after. Back to Erma and Feima. After the financial help of the Heereswaffenamt Feima became solely an arms equipment company, they began production of 98k’s and machinegun parts. 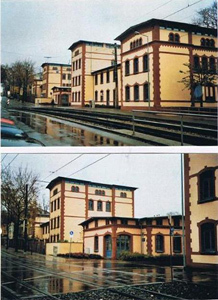 Because of it’s earlier financial problems, Feima had sold it’s buildings and grounds to a very large State-owned real estate company called “Verwertungsgesellschaft für Montanindustrie GmbH”, which still exists today under the name of “IVG Immobilien AG”. For some unknown reason, which probably had to do with the influence of the Wehrmacht or payment problems, Feima was handed over in March 1939 to the management of the “Oberkommando des Heeres”. In 1933 Geipel asked his brother, Elmar Geipel, to work for him and Elmar became engineer at Erma. His son, Rudolf, completed his degree in Mechanical Engineering in Leipzig and joined the Army. Rudolf was initially assigned to the occupation forces in France, and later as weapons specialist in Germany and Norway. On the 19th of January 1940, Geipel became city councilor in Erfurt, which as a member of the Nazi Party and his status as an arms manufacturer this was not a big surprise. Also in 1937 Berthold Geipel became “Wehrwirtschaftführer”(defence economy leader). Because of the Wehrmacht’s continuous growing demand for weapons, ERMA and FEIMA needed more qualified personnel to produce these weapons, however, German manpower was being diverted through mobilization and these qualified German workers were simply not available anymore. Nazi Germany then had to make use of more and more foreign and slave laborers. In total, about 9000 of these slave laborers were working in the city of Erfurt and FEIMA, was also making use of slave laborers. Beginning in 1940, as can be seen on factory plans from that era, FEIMA started building barracks for these workers. In 1943, ERMA developed an extremely simplified sub machinegun known as the EMP44. Because of this “cheap” look the EMP 44 was never accepted, and only a few prototypes were made. As of December 1944, Erma also started producing, under license, the new MP44 or Sturmgewehr 44 (Stg44). Finally, in January 1945 Erma also produced the “Volksmachinenpistole MP3008” which was a cheap copy of the British Sten. On February 1945, 79 Mosquitoes of the R.A.F dropped almost 100 tons of bombs on the South and East of the old city centre of Erfurt, causing 223 deaths. In this attack all the ERMA factory buildings were destroyed, and only the cellar was not destroyed. This was the end of ERMA while FEIMA only had a small amount of damage till the end of the war. In this last chaotic period of the war it is assumed that Geipel had tried to relocate to the south of Germany with some of his specialists and machinery. Geipel was arrested as a war criminal and kept in prison by the Allied occupational force. In Werdau/Sachsen he applied for de-nazification and lived with his brother. After his son Rudolf was released in 1947 from French imprisonment, it is believed that he started working as assistant Director, just like his son, with an old acquaintance, Heinrich Vollmer, at the “Vollmer Waffenwerken”. As result of an order by Marshal Shukow of the Russian occupational force, both ERMA and FEIMA were liquidated. ERMA on the 31st of August 1948 and FEIMA on the 21st of October 1948. In 1949, ERMA was re-established again in Bayern, and in 1952 they moved to Dachau near Munich. Son Rudolf Geipel was the Leading Engineer of the new ERMA. The first few years of the new ERMA production was geared to making parts for the allied occupational force. Later, ERMA also produced parts for armored vehicles of the newly raised Bundeswehr. More and more ERMA was focusing again on handguns for the sport shooters. In 1961, ERMA was taken over by Fiberglide though the name “ERMA” was still used as a trade name under Fiberglide. After several name changes ERMA was again used as the primary trade name. After the sale in 1961 the Geipels did not play any role anymore within this company. In 2003 the company was bankrupt. In the end, Berthold Geipel died on the 26th of January 1971 at the age of 82 in Munich. His son Rudolf died on the 13th of November 2002 also in Munich.